Provide comfort for the family of Eileen Eberhard with a meaningful gesture of sympathy. 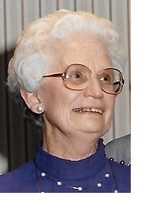 Eileen Frances Eberhard, 94, of 259 Watson Road, Hinsdale, died peacefully Thursday, March 21, 2019, at her home. Born in Pittsfield on February 4, 1925, the daughter of John and Genevieve Davin Loehr, she was educated in Dalton schools and was a 1943 graduate of Dalton High School. marriage, and had also worked at Sears for several years. She enjoyed puzzles and board games, especially scrabble, and taking walks in the woods. Her husband, William Eberhard, whom she married April 19, 1954, died April 24, 1995. Hinsdale, as well as eight grandchildren and eight great-grandchildren. Reynolds, Lead Pastor, and Retired Pastor: Rev. Philip Thurmond, officiating. Burial will be in Maple Street Cemetery, Hinsdale, later in the Spring. Calling hours will be Monday, from 5:00 to 8:00 p.m., at DERY-FOLEY FUNERAL HOME in Dalton. In lieu of flowers, memorial contributions may be made to Reigning Love Church in care of the Funeral Home, 890 East Main Street, Dalton. To send flowers in memory of Eileen F. Eberhard, please visit our Heartfelt Sympathies Store. Donations are being accepted for: REIGNING LOVE CHRISTIAN CTR.